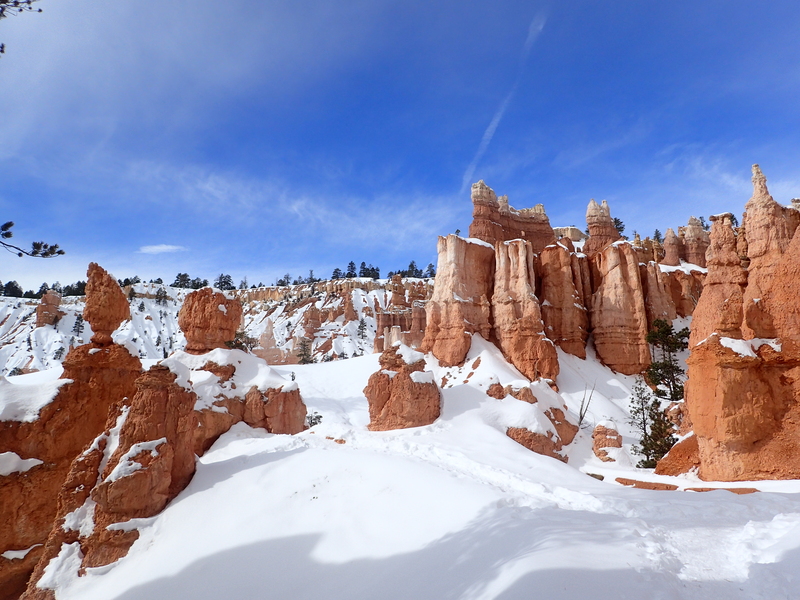 After our second day in Zion National Park turned out to be a bit of a bust we made our way over to Bryce Canyon National Park for our second stop of the day. 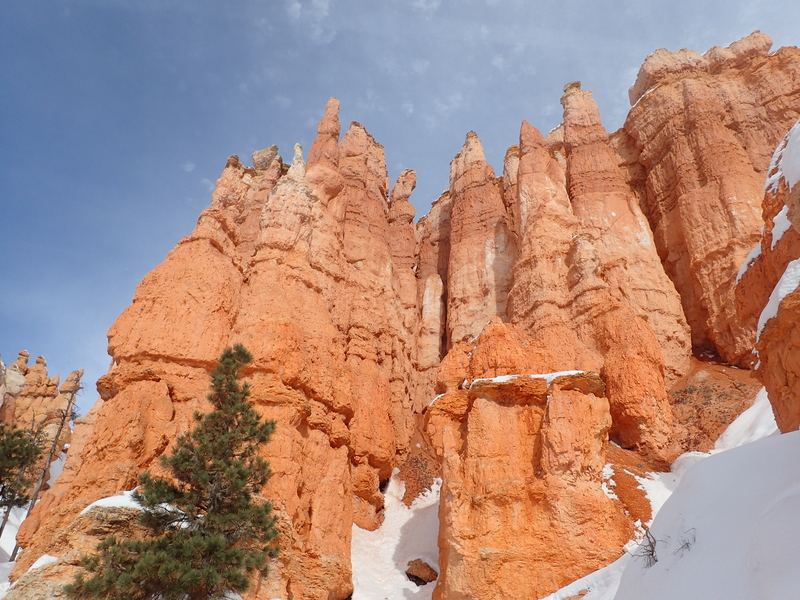 I had never been to Bryce Canyon before but I had heard so many good things that I was excited for the visit. 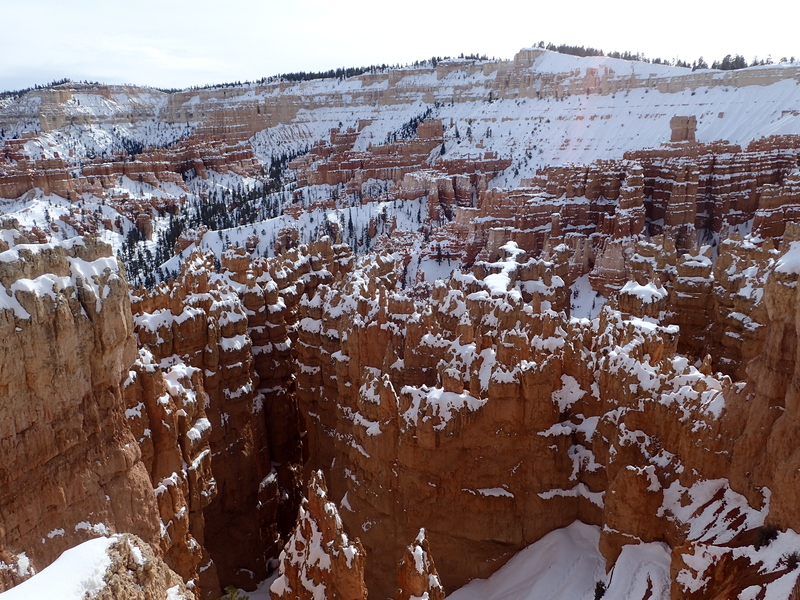 After visiting Cedar Breaks National Monument back in August my buddy Stav from http://www.stavislost.com had told me that Cedar Breaks was just a mini Bryce Canyon and that I really had to make some time to visit it. 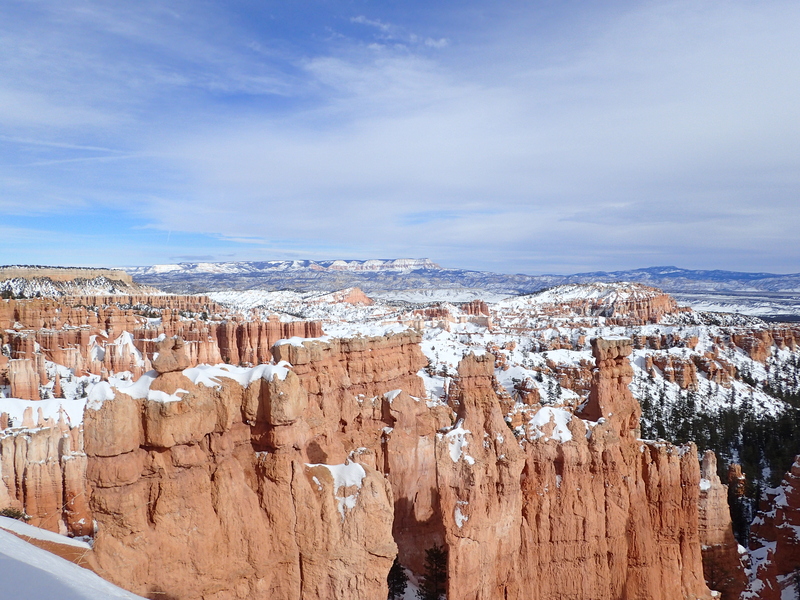 After visiting Bryce I have to say that he was absolutely correct. The park exceeded all of my expectations. 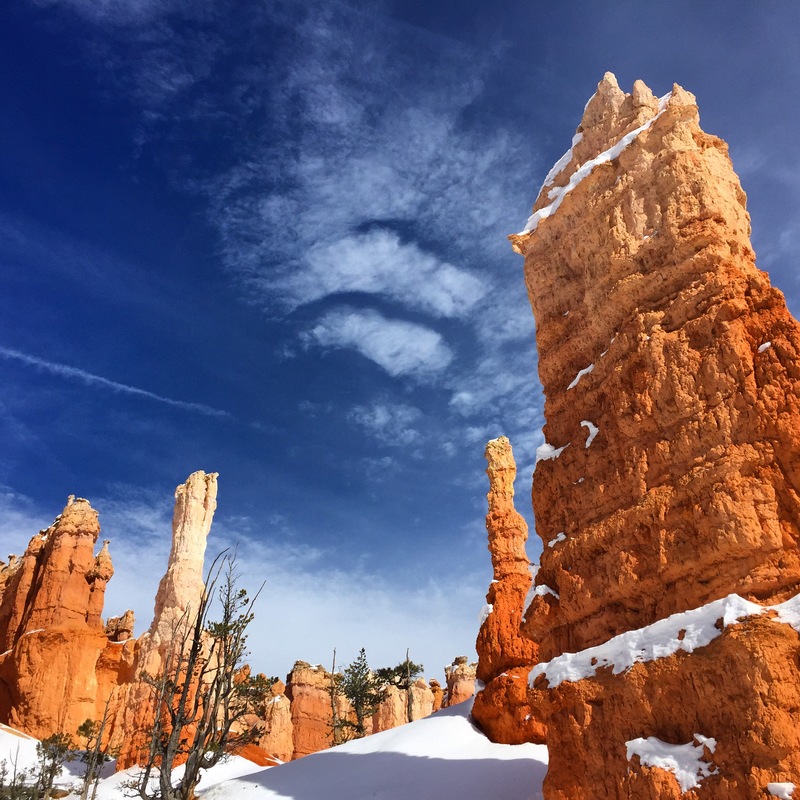 After making a quick pit stop at the visitor center we made our way over to the Sunrise Point trailhead which was the best place to start our hike of the Queens Garden – Navajo Loop. We packed up our gear and set out at around 2pm. 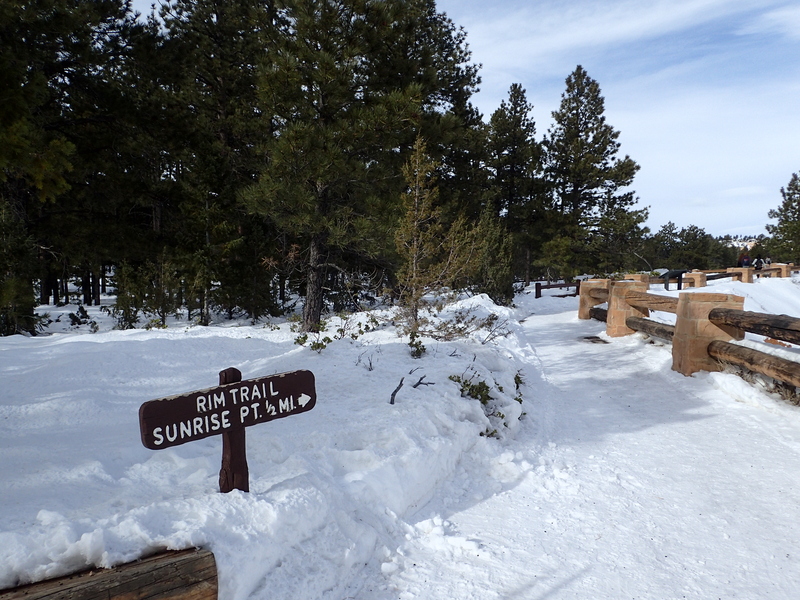 Start of the Sunrise Point trail. 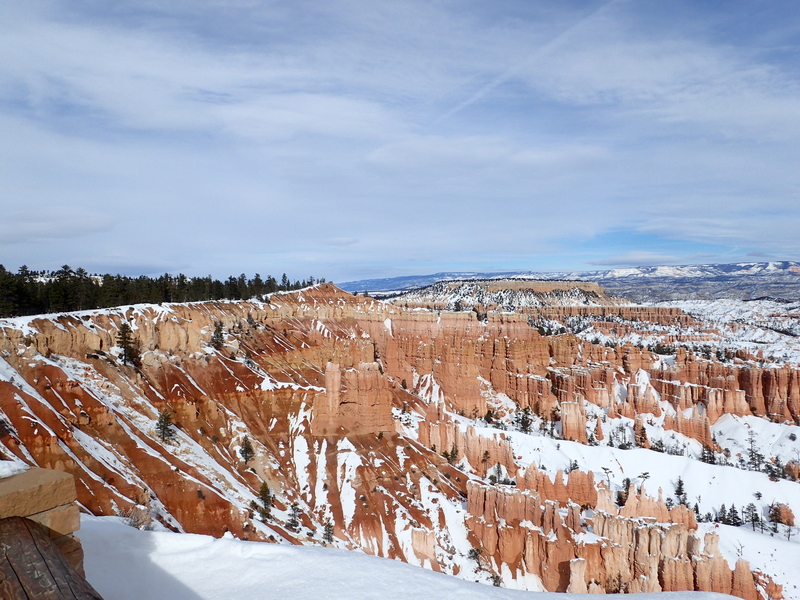 The hike started out on the Sunrise Point trail which leads along the ridge of the canyon out to a beautiful overlook. 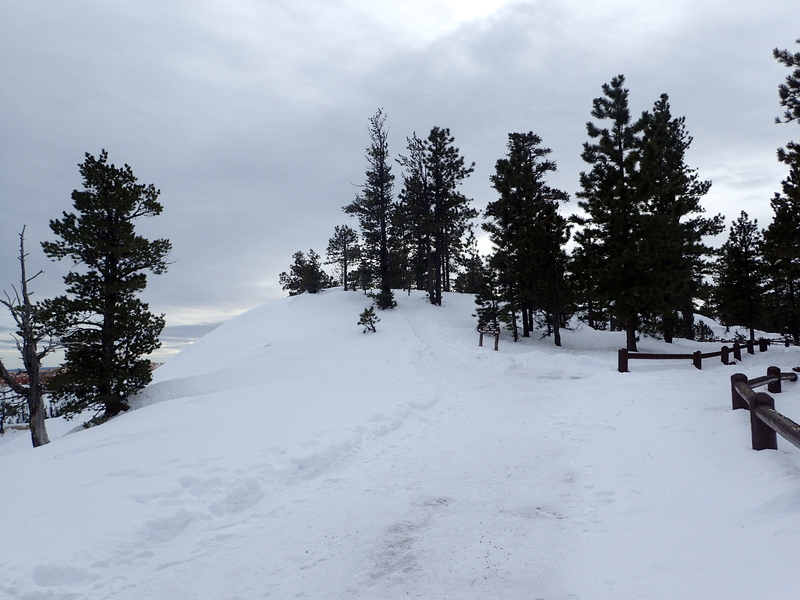 The trailhead sits at about 8,000 ft in elevation and everything was covered in a thick layer of powdery snow. Since you start the hike on top of the ridge you are immediately hit by the beautiful views on the horizon. View from the very start of the trail. After stopping to enjoy the view from the start we continued on our way along the trail towards Sunrise Point. 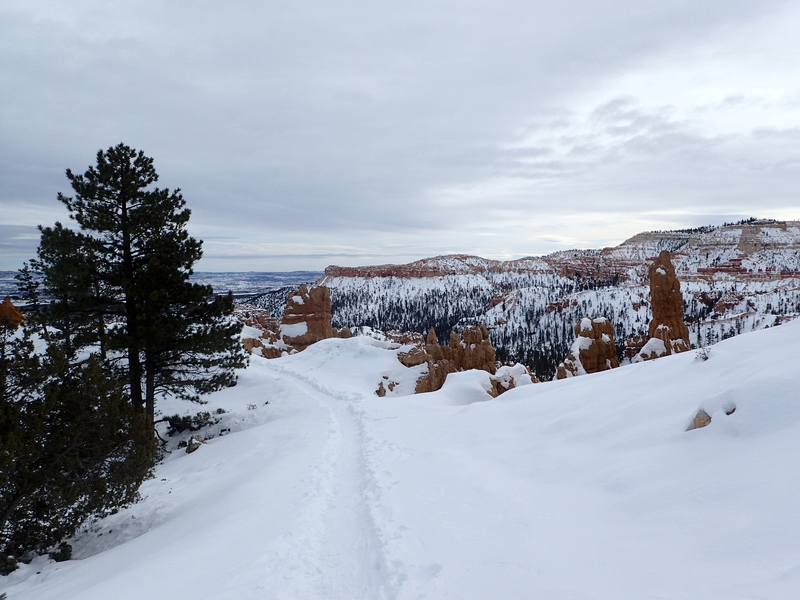 The snow on the trail was well packed and all we used throughout the hike was our micro spikes but snowshoes would have also been a good choice. 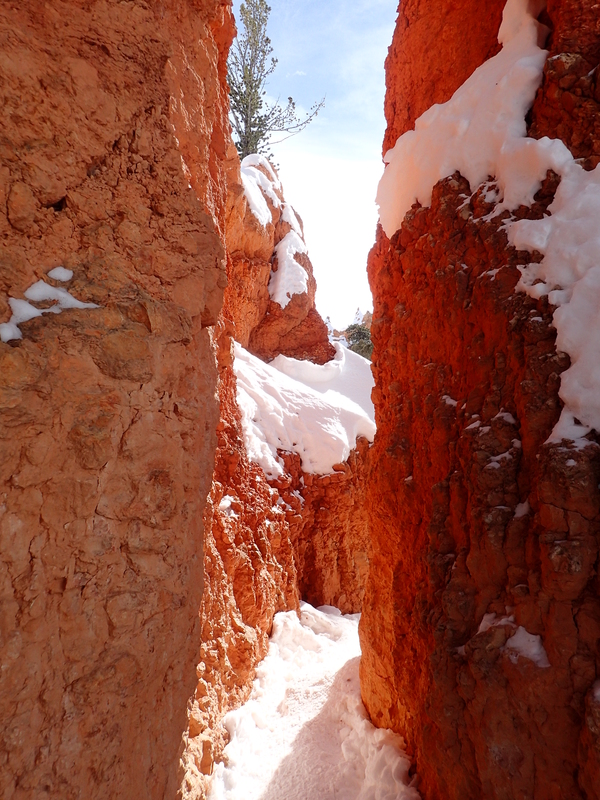 Sunrise point is a raised platform that sits at the trail junction for the start of the Queens Garden trail and offers beautiful views of the orange red canyon of eroded rock that Bryce Canyon is famous for. However, despite its name, according to the park brochure it is actually not the best place in the park to watch the sunrise. After enjoying the views from Sunrise Point we made our way over to the start of the Queens Garden trail. The views were fantastic from the overlook but I was honestly so excited to get down into the canyon that I probably rushed the experience more than I should have. Start of the Queens Garden trail. The trail overall is not technical and due to the heavy traffic the trail was very easy to follow as it wound its way down towards the canyon floor. The trail wove its way along a narrow ridge with steep drops off the sides of the trail down to the canyon below which added a really exciting effect without actually being dangerous. 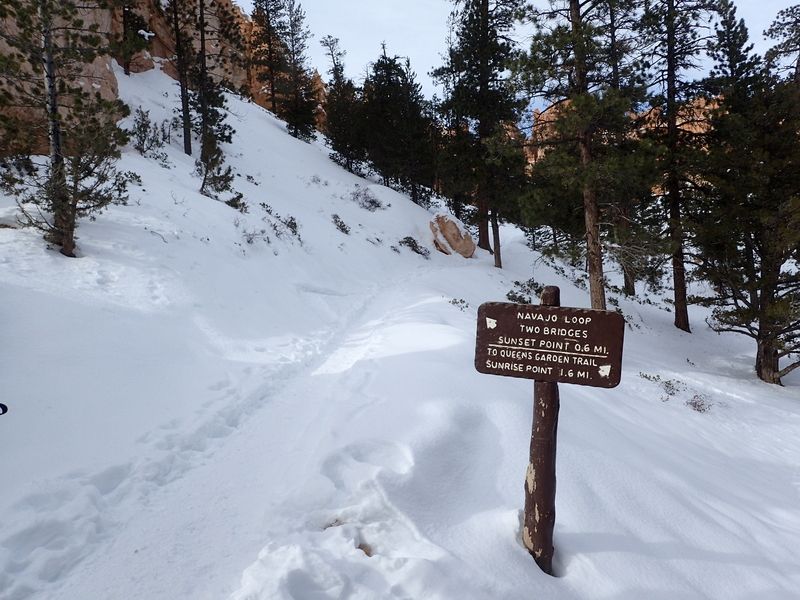 The start of the trail leading into the canyon. 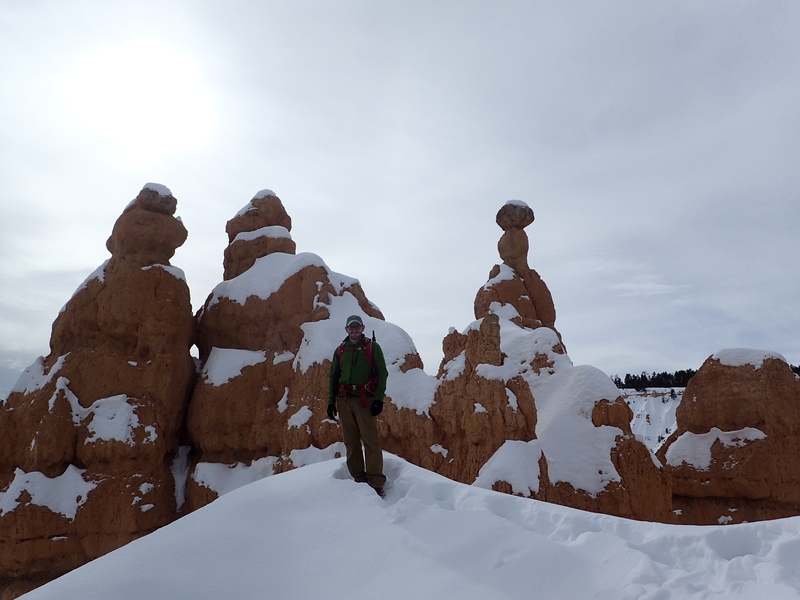 Me standing on a small snowy ledge. View looking out from the trail away from the canyon proper. Once we reached the bottom of the short ridge line leading down into the canyon we turned a corner and made our way down a short switchback into the canyon proper. It was after this point that the beauty of this hike really became apparent. It was as if mother nature flipped a switch and turned on the brightest blues and oranges that I have ever seen cast against a blanket of white. Looking towards the archway near the base of the canyon from the top of the switchbacks. 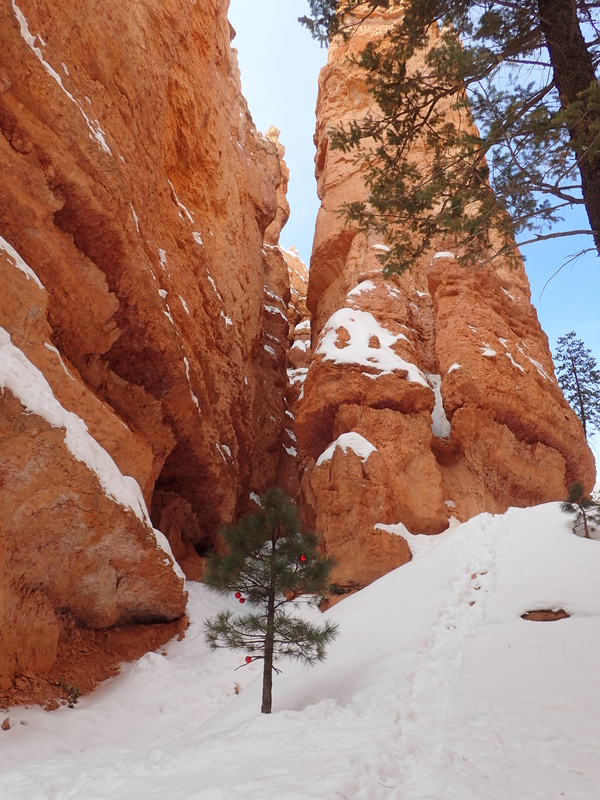 At the base of the switchbacks was a small archway that the trail goes through as the trail winds its way through a seemingly endless sea of bright orange hoodoos. 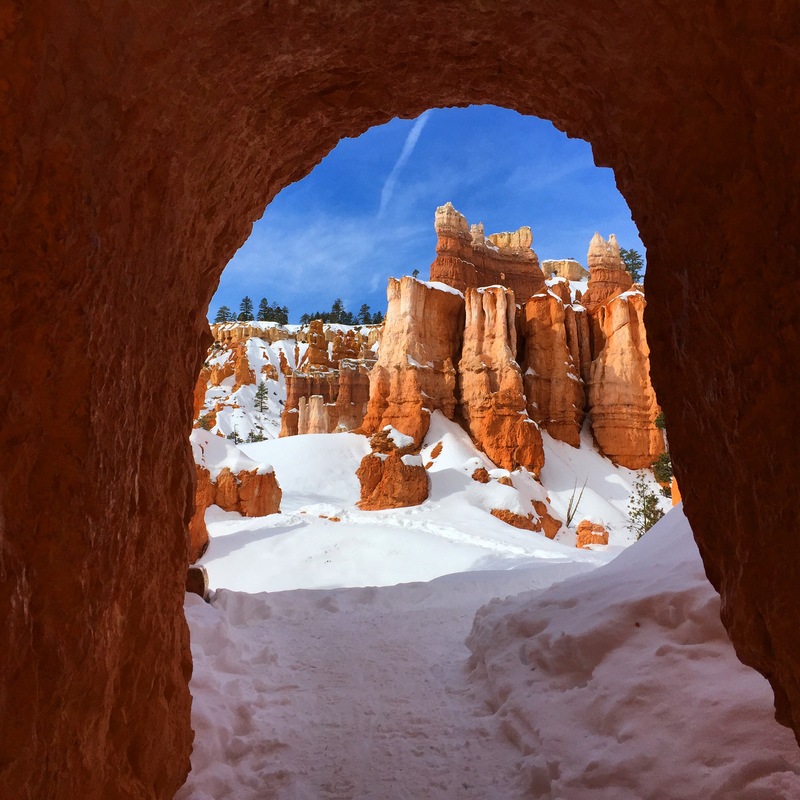 Looking through the archway at the hoodoos beyond. Once on the other side of the archway the trail continued winding its way through the canyon with beautiful views in every direction you looked. 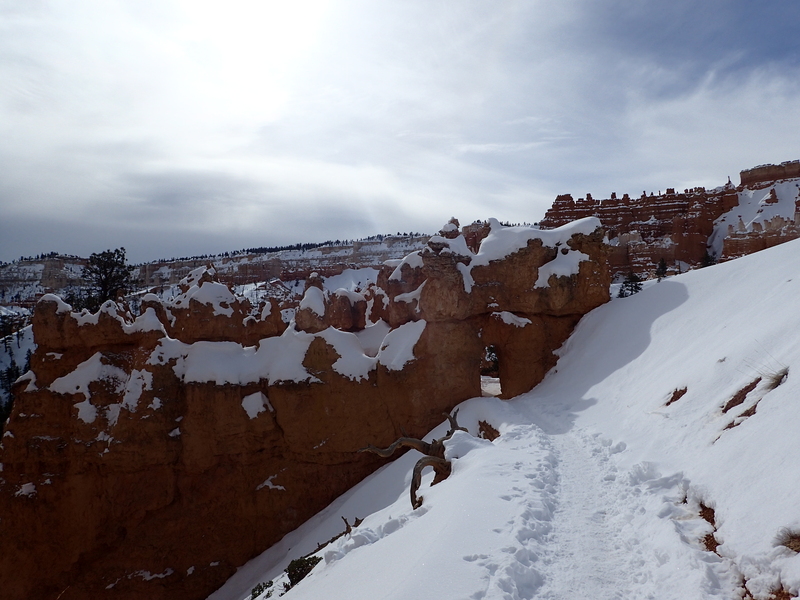 The snow was a bit deeper here but it was so well tracked out that we were fine hiking in just our micro spikes. 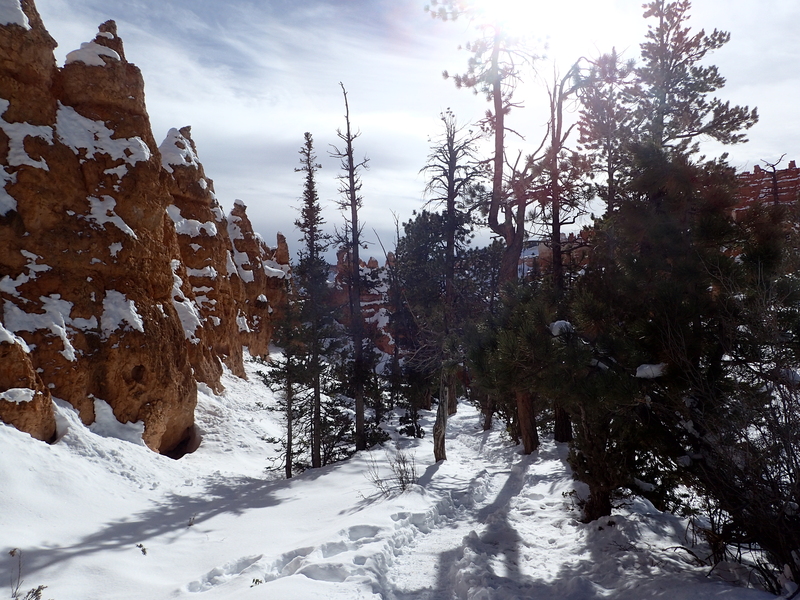 The trail winding its way through the hoodoos. Looking up at the canyon walls above. The trail then wound its way through another archway that lead us to the final short section before reaching the end of the Queens Garden Trail. The second archway on the trail. After passing under the second arch the landscape opens up to reveal a more open space surrounding us. Nestled in the canyon it was easy to feel like you were on another world even though our car was parked less than a mile away. More open space after passing through the second archway. 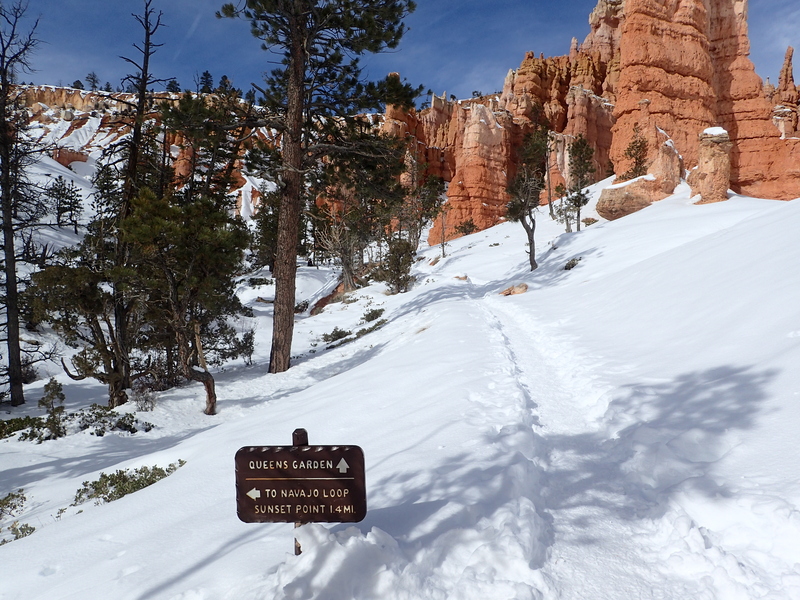 After walking on a couple of minutes more down the trail we reached the trail junction which marked the split between the Queens Garden and the Navajo Loop Trail. 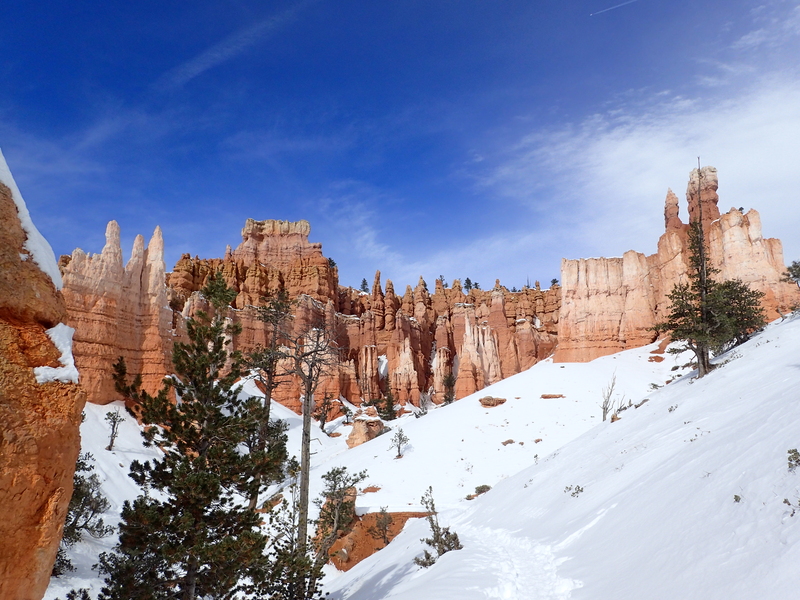 Trail junction for the Queens Garden and Navajo Loop Trail. We made our way down to the Queens Garden which was only a short distance ahead. From this point it is possible to observe the namesake of the trail which is a large formation that is named after Queen Victoria. Although I can’t say I really “saw it” I suppose you could say there is a bit of a likeness to a queen sitting on her thrown in the formation. Perhaps I just don’t have enough imagination, but in any event it was still quite a scenic place to take in. At this point the Queens Garden trail also comes to an end. Sign marking the end of the road. Part of the problem in viewing the Queen may have been the angle we were looking at it from down by the end of the trail but either way I didn’t make much of an effort to get a better view. 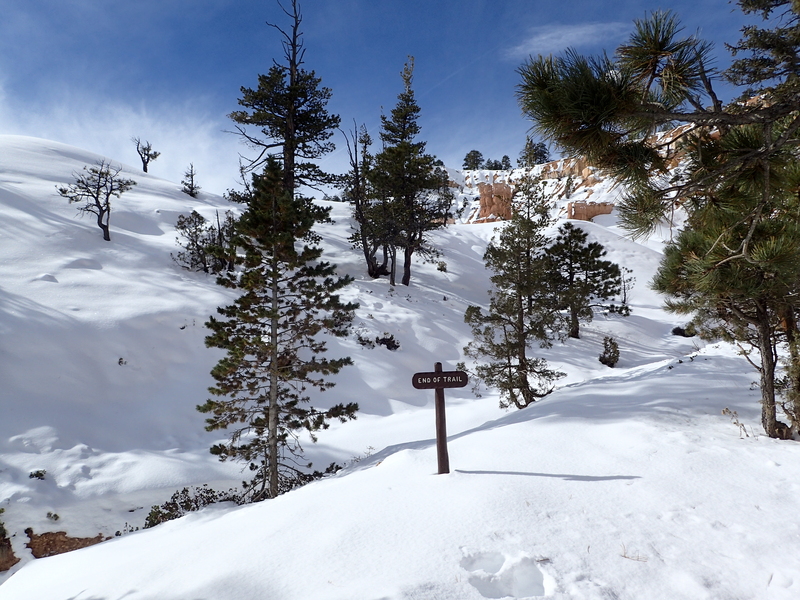 I preferred seeing what I could instead of trampling through the snow off trail and perhaps ruining the pristine look for others just to get a better shot. The best shot I managed to get from the vantage point at the end of the trail. After taking in the view we made our way back down to the trail junction and made a turn down the Navajo Loop Trail back towards Sunset Point. At this point I suppose you could just go back the way you came for a shorter trip but doing the loop only adds about a mile and is absolutely worth it for the views along the way. The next section of trail was more wooded than anything we had already passed but in my opinion it only added to the diversity of this hike and did not detract anything from the experience. 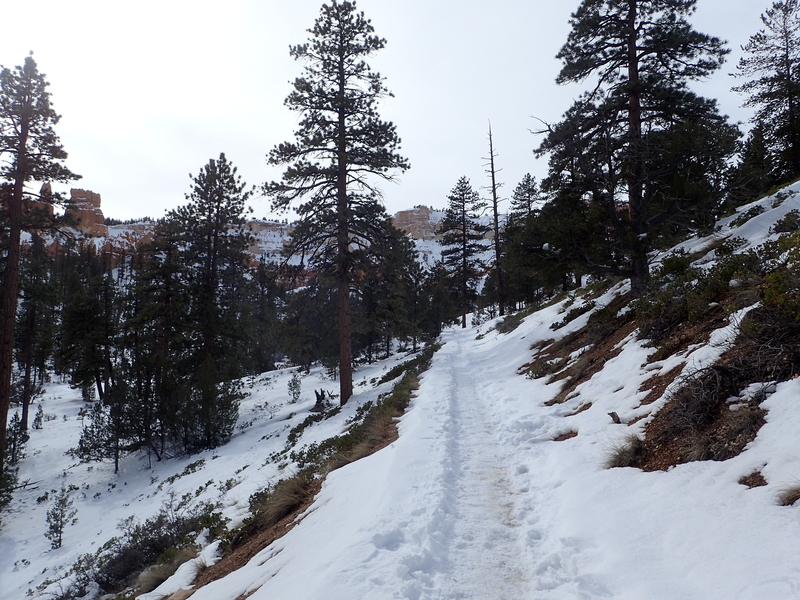 The more wooded trail as we worked our way down the Navajo trail. 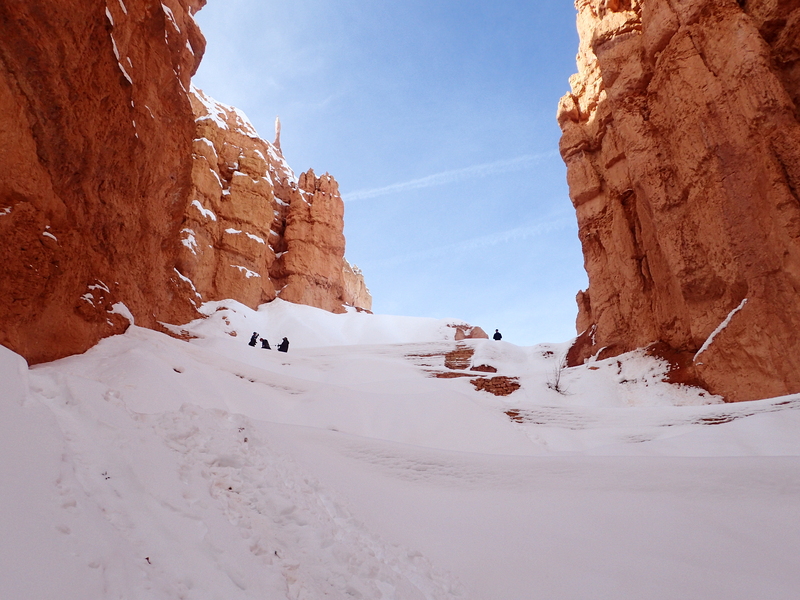 The trail still had plenty of interesting elements and sights to see as we wove our way through the canyon floor. A short slot that the trail passes through. The trail didn’t disappoint in diversity of great and unique views. More wooded section as we looped around the base of the canyon. This was the longest section of the hike without reaching any particular landmark and overall is very flat compared to the steep decent down to this point. The trail worked its way through the flat base of the canyon before we reached the trail junction for the trail leading back up to the rim of the canyon. Trail junction pointing the way back up to the canyon rim. 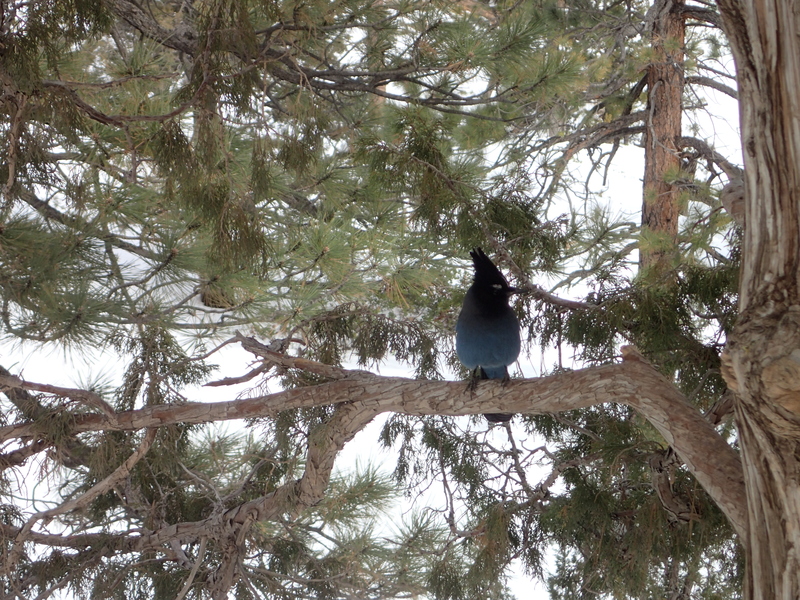 Steller’s Jay spotted perching on the tree next to the junction. We stopped for a quick drink at the junction before making our way down the trail for the last 0.6 miles back up to the rim. From here the trail climbs pretty steadily upwards towards the rim. Someone was feeling a bit festive. This section is not particularly hard but it is probably the only part of the hike that anyone might find physically challenging. The trail winds its way up an increasingly narrow slot in the canyon before reaching a final set of switchbacks that lead you up to the rim. Looking up towards the switchbacks. 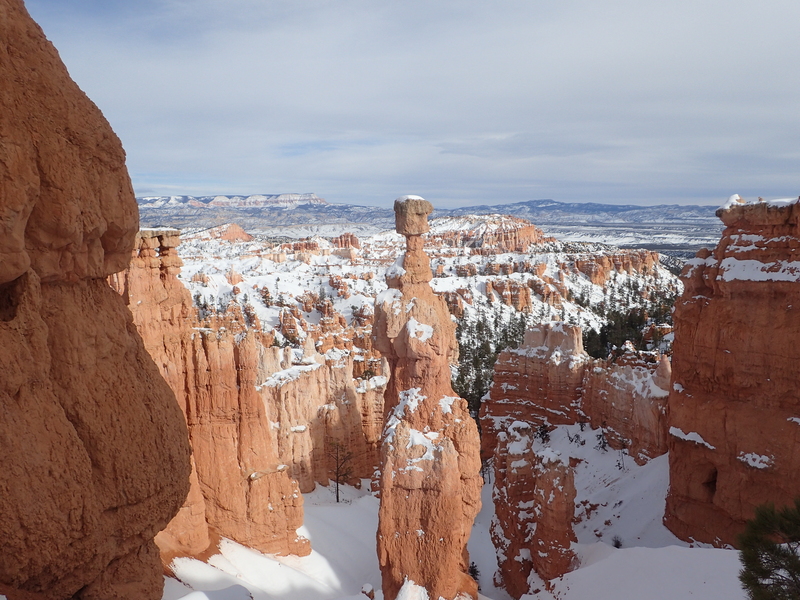 As you reach the top of the switchbacks the views only get better as you can observe the brilliant hoodoos in every direction. Including the famous formation known as Thors Hammer. We made it up the switchbacks in no time and were greeted by wonderful views of the canyon beyond. It was hard to take it all in as everywhere you looked was something more beautiful than the last. 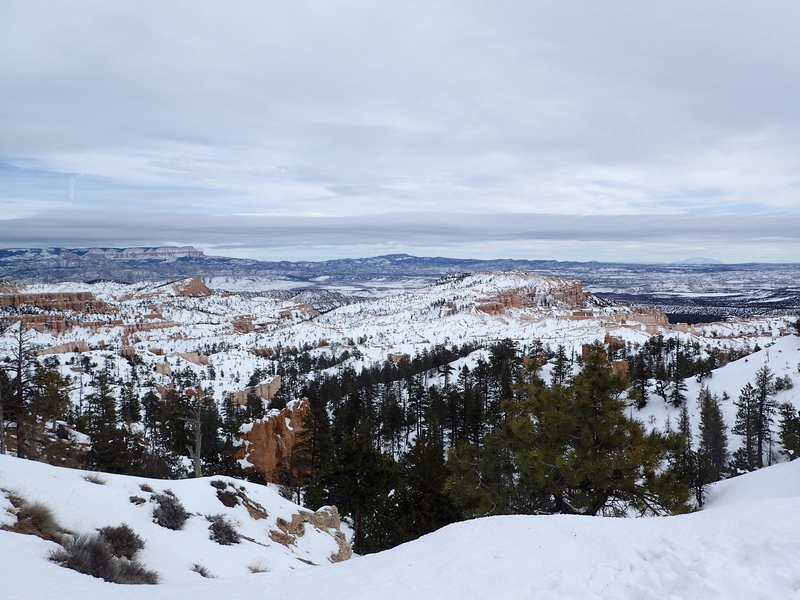 Looking out from the top of the switchbacks after exiting the narrow canyon section. 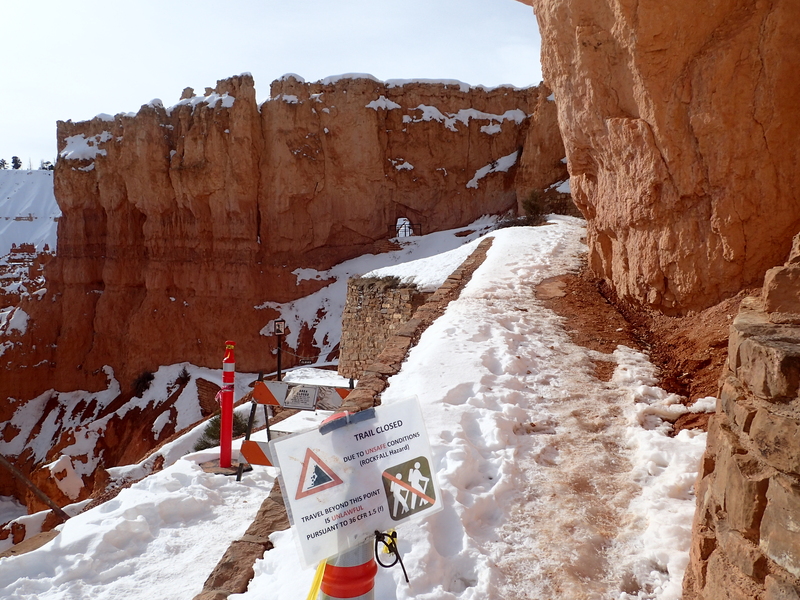 I should note that there is an alternate route up this portion of the canyon known as Wall Street, which is a more steep and difficult trail but it was closed during our visit as is common during the winter months due to unsafe conditions. Normally I would be disappointed by something like this but after our trip to Zion the closure didn’t even faze us. Sign marking the closure of the Wall Street trail section. The man was still trying to keep us down. 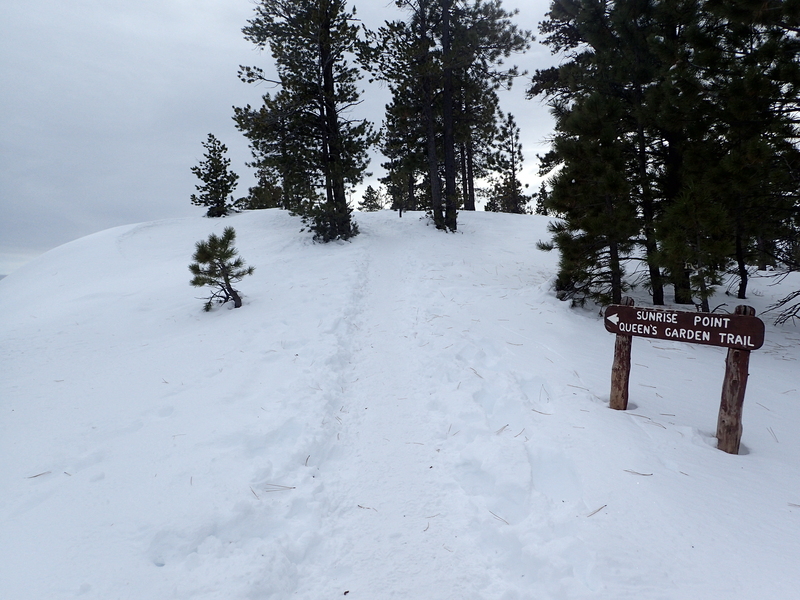 From this point there are only a couple of short switchbacks to navigate before reaching the top of the rim. From this point there are still more views to be had as well. Looking back down into the canyon from the top of the switchbacks. Looking out over the canyon beyond from the rim. Once we got back to the top of the rim it was as if we had rejoined the real world after visiting somewhere entirely different. 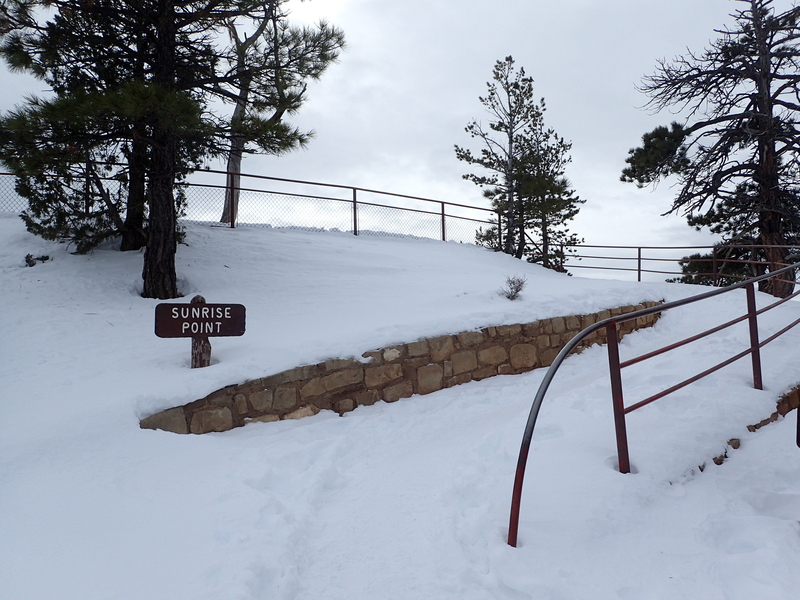 We had exited the canyon onto a more civilized overlook that is perhaps confusingly, named Sunset Point. 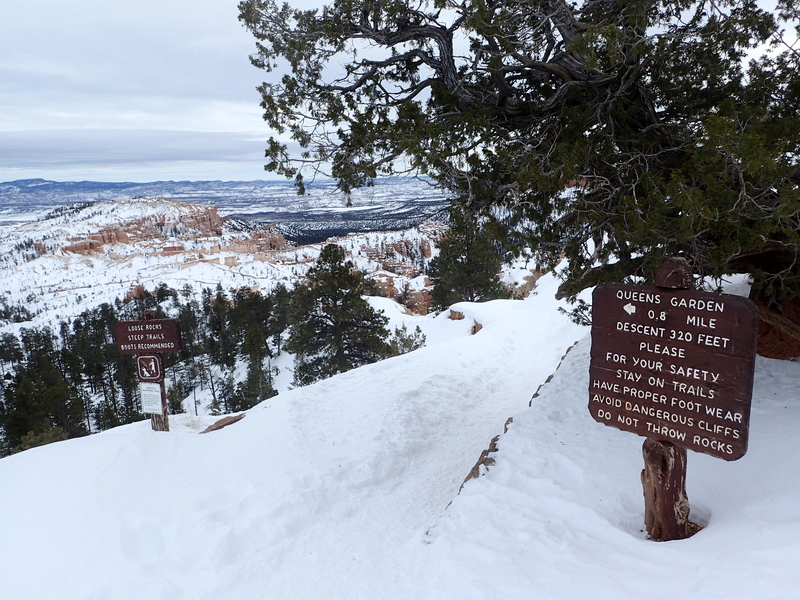 After taking in the views we followed the sign leading down the rim trail back towards Sunrise Point where we had started. From here the trail was no more than a snow covered path which lead us back to the parking lot but the views still did not disappoint as we made our way along the rim. 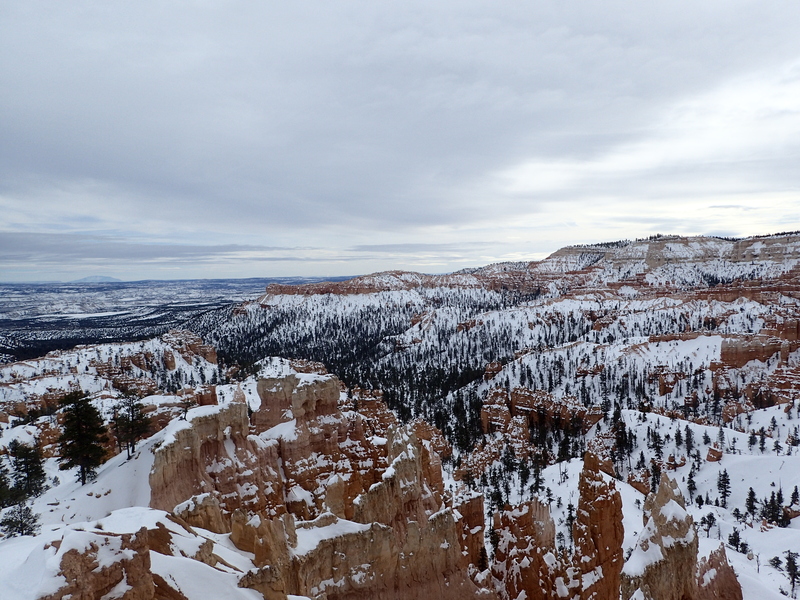 View looking towards Sunrise Point from the rim trail. After only hiking for about an hour or two we made it back to our car and our only disappointment was that the hike was not twice as long. 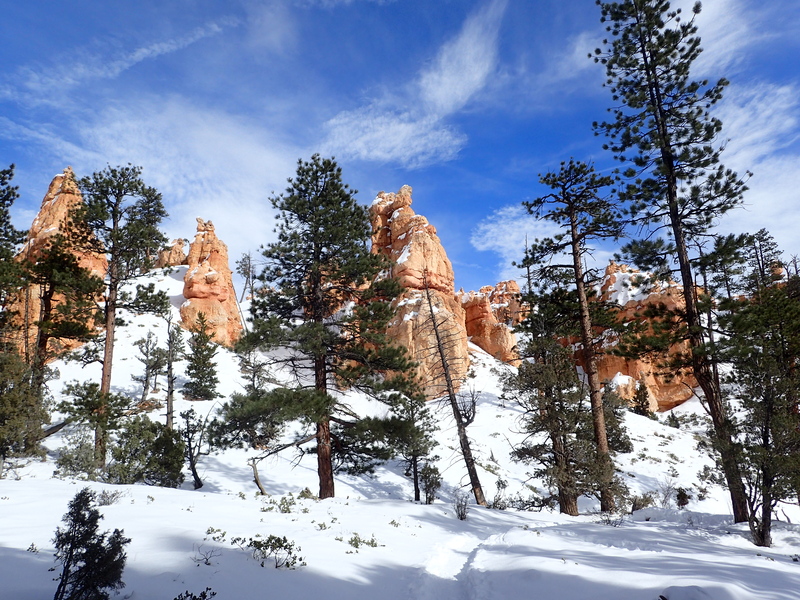 The Queens Garden Navajo Loop trail is not a long or difficult trail by most anyone’s standard but in my opinion is one of the most beautiful and unique hikes I have ever done. The landscape and especially its scale is incredibly unique to the area and this particular trail offers you a perspective that I can’t say I have experienced anywhere else to date. My only complaint would be that the trail is not very long and generally I prefer much more physically demanding hikes but what it lacks in these departments it certainly makes up for in others. 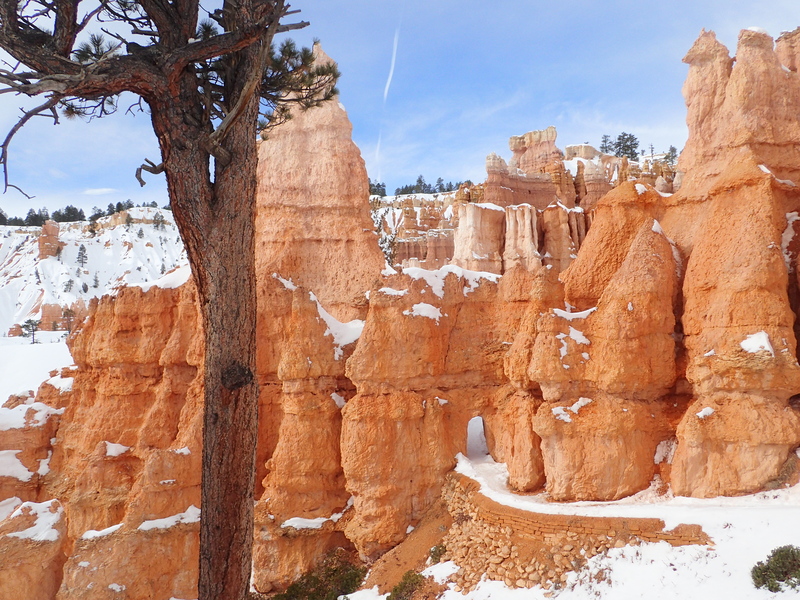 By the end I was thoroughly ashamed that I had never made visiting Bryce Canyon a priority. 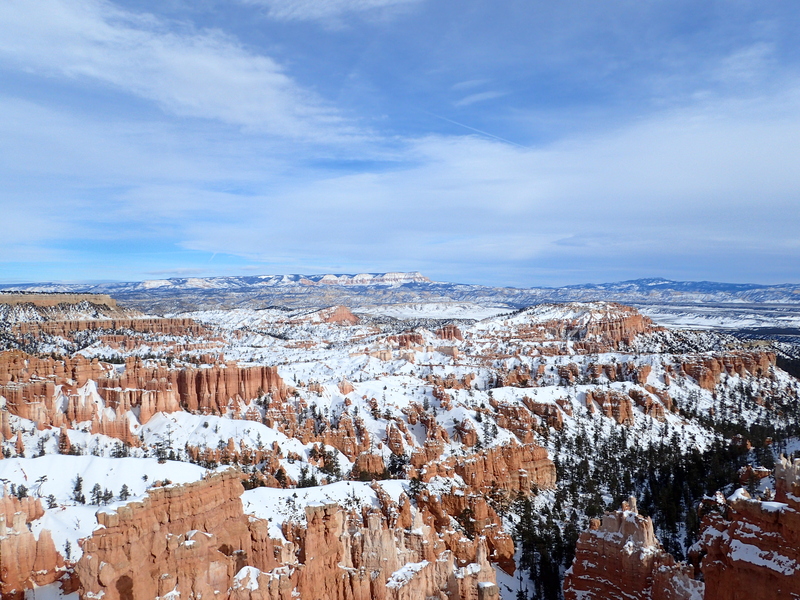 However, despite how much fun we had doing this short little hike we knew we would have to wait for our next trip out to Bryce Canyon to experience more of this beautiful landscape. After packing up the car we settled in for our long drive up to Moab. 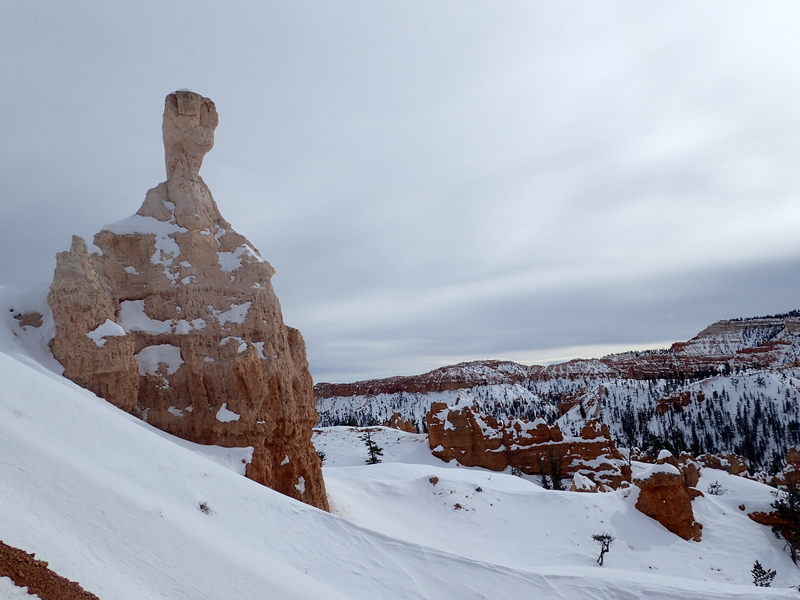 This part may sound like a bit of a bummer but it was honestly a great experience in its own way as the drive up to Moab took us through a large chunk of the Grand Staircase – Escalante National Monument as well as directly through Capitol Reef National Park. The views we saw along this stretch of scenic highway 12 were magnificent and I would highly recommend this route to anyone.